"Section 1. The bird known as the Western Meadow Lark, Sturnella-Neglecta (Audubon) as preferred by a referendum vote of Montana school children, shall be designated and declared to be the official bird of the State of Montana." The following information is excerpted from the Montana Code Annotated , Title 1, Chapter 1, Section 1-1-504. 1-1-504. State bird. 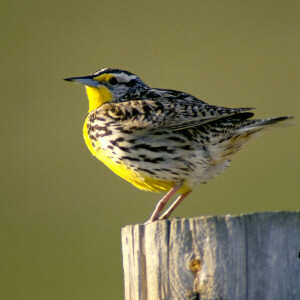 The bird known as the western meadowlark, Sturnella neglecta (Audubon), as preferred by a referendum vote of Montana school children, shall be designated and declared to be the official bird of the state of Montana. History: En. Sec. 1, Ch. 149, L. 1931; re-en. Sec. 530.1, R.C.M. 1935; R.C.M. 1947, 19-116. Birds Of Montana: Field Guide: by Stan Tekiela. The Lewis & Clark Expedition: Montana's First Bird Inventory Through the Eyes of Lewis and Clark: by Kenneth C. Walcheck.